MY IPAD ISN’T PLAYING WELL WITH THIS WORDPRESS SITE SO UNTIL I CAN WORK OUT THE ISSUES PLEASE GO TO MY FACEBOOK PAGE FOR UPDATES FROM THE TRIP. On this page I’ll be posting information about the pre-trip preparations for the 631-mile trip. PLEASE NOTE: The latest information will always be added at the top of this page, so those interested can easily find the most recent additions. Today I spend packing for the six-week trip and picking up all the last minute items that always seem to come to mind. After packing I took the gear over to a buddy’s shop and weighed it all on a digital scale he has on his loading dock (Thanks John!). 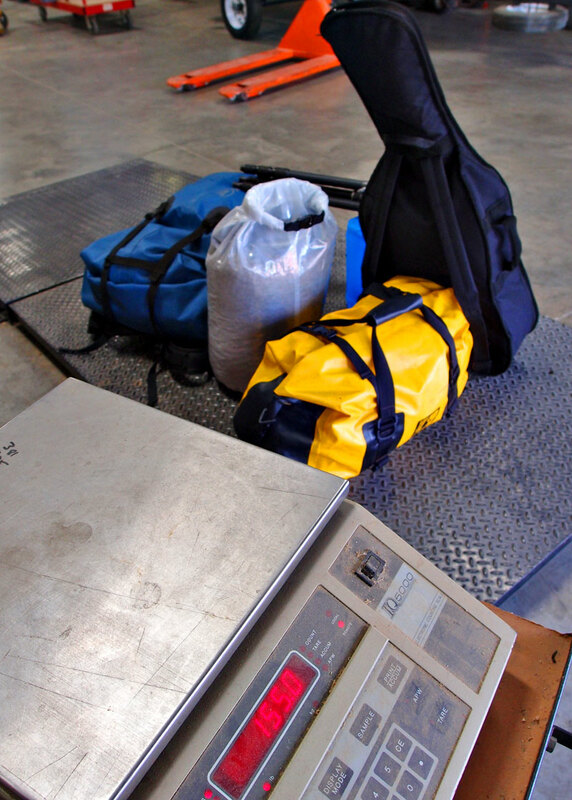 I was pleasantly surprised that the weight for all our food, camping gear, about 3 gallons of water and the Carbonola guitar with case was 155 pounds. I still have a few pounds of the iPad, pistol, clothing items, etc. that weren’t weighed, but I’m thinking they’ll amount to less than 10 pounds total. The photo below was taken this afternoon with pretty much everything ready to go in the morning. I priced Yakima roof racks for my old ’97 Toyota T-100 truck and it was like $439 before sales tax! So I went another route and drove to our local Ace Hardware and bought a stick of pipe insulation for about $4 that works just fine. Oh, and I still have about 1/3 of it left over! Since I’ve been told it’s possible the gators in the Tensaw Delta might see Roscoe and Bailey as a tasty treat and try to come after them in the canoe, I purchased a Taurus Judge handgun that shoots either Colt .45 rounds or .410 shotgun loads. Of course I hope the gun never leaves its holster, but if it becomes necessary it will most likely be a close-range shot from the canoe with the dogs aboard, so I wanted to test their reaction to a gunshot before we find ourselves in that situation. So we loaded up with gear much like we’ll be packed on the trip and went to a slough on the far side of our lake at Blount Springs for a test. As you can see in the video, they both flinched a bit, and Roscoe thought about bailing out, but didn’t. Anyway, I feel better about it now after testing. Well, yesterday I got troubling news… I found out that several items of camping gear that were promised to be here weeks ago were not going to be available to me, so it sent me scrambling to the local Bass Pro Shops store in Leeds to try and find substitute items. These included solar panels to recharge my camera, iPhone and iPad for parts of the trip when I won’t have access to electrical power. Other priority items were a waterproof drybag with backpack straps (for portages), PFD, a tarp and several other odds and ends of clothing, shoes, hat, etc. 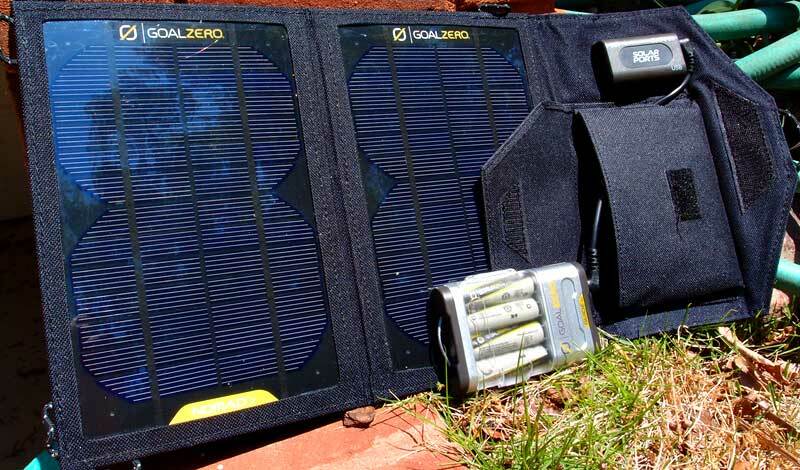 The sales guy at the Bass Pro Shops assured me that the $120 GoalZero Guide 10 Adventure solar kit would handle charging both the iPad and iPhone, but once I got it home and opened (destroyed) the packaging, I discovered a note in the manual stating that this model would not charge the iPad because it required a 1 Amp USB source. 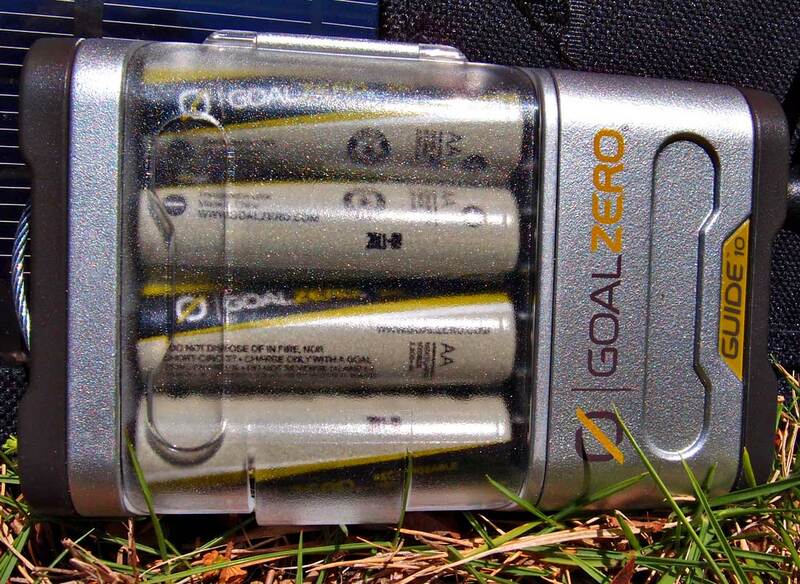 I contacted the company this morning and a nice guy named Alex informed me that I had to have the newer Guide 10 Plus battery pack ($60) and that since the store had given me improper info on the model I was buying he could discount the unit. However, with shipping to get it to me in time for the trip it was still over $70, so now I’m into the solar power world for a total of over $200! I was disappointed that I had to pay for shipping, but at least he discounted it some. Still, to me the packaging and website are a bit deceptive about what is required to charge the iPad and I’d recommend anyone shopping for these units to carefully check compatibility with the company before ordering! 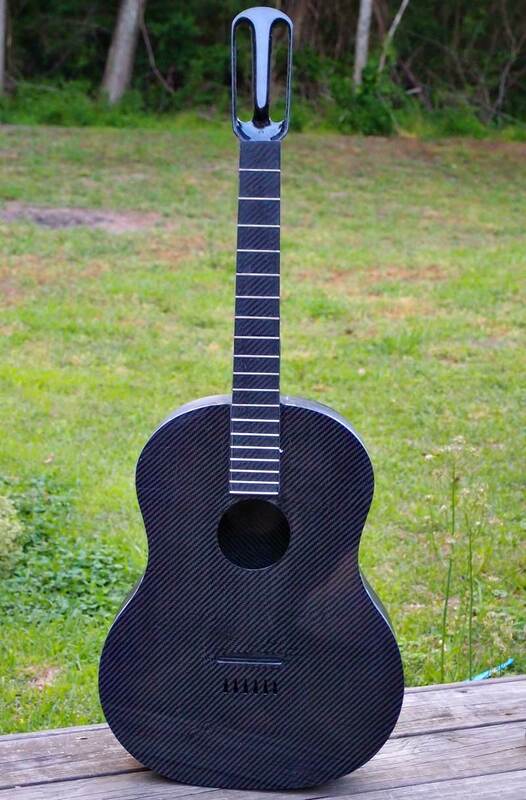 Saturday morning my brother Bill put the finishing touches on his carbon fiber guitar project – The Carbonola – buffed out the final coat of wax and strung her up. Then we made our way to Birmingham’s Southside to Highland Music, who’d donated guitar strings to the project on the condition that he’d bring the finished guitar down for them to check out when completed. Everyone there was duly impressed with the guitar. Tony Lombardo, who teaches guitar there, put the new instrument through its paces and made her sing! Now I’m even more excited to have this guitar along on the river trip. It weighs practically nothing and water won’t harm it! Monday I rode down to Wetumpka to Coosa River Adventures, the second of three locations along the Alabama Scenic River Trail where I will leave caches of dog food and my food. I also rented a sit-on-top kayak from them to scout routes for my relatively fragile wood and fiberglass canoe because this 7-mile stretch of the Coosa below Jordan Dam is the only whitewater on the entire River Trail. 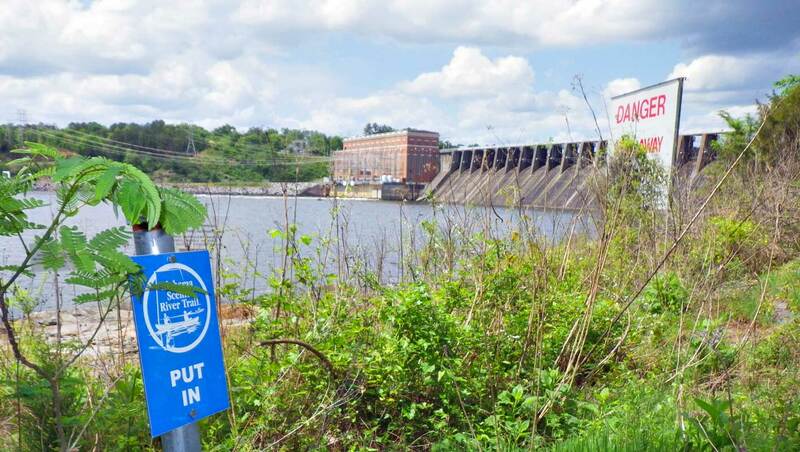 I was told that throughout the months of April and May the daily flow would be the same – about 8,000 cubic feet per second. At this level I only bumped into one rock Monday and that was because I wasn’t paying attention. The only significant rapid – Moccasin Gap – was the one I most wanted to scout to decide how to approach it when we return in late May en route to Fort Morgan. In the video below a couple runs the center chute of the rapid in a tandem sit-on-top kayak. After studying on it for a bit I decided this route would likely swamp our heavily laden, fiberglass canoe with over 150 pounds of active dogs, so I’ll probably run the rapid to the extreme left side of the river, where the drop is made up of several smaller ledges instead of a single large elevation change. Thanks to my good friend David Atchison of the Daily Home newspaper in Pell City, I now have the first of three caches of dog food safely stowed away until I reach Lake Logan Martin on the Coosa. I’ll also be leaving food and dog food at two other places en route – Wetumpka and near Camden. David, who is also an avid paddler, plans to join me for some of the section around Logan Martin. 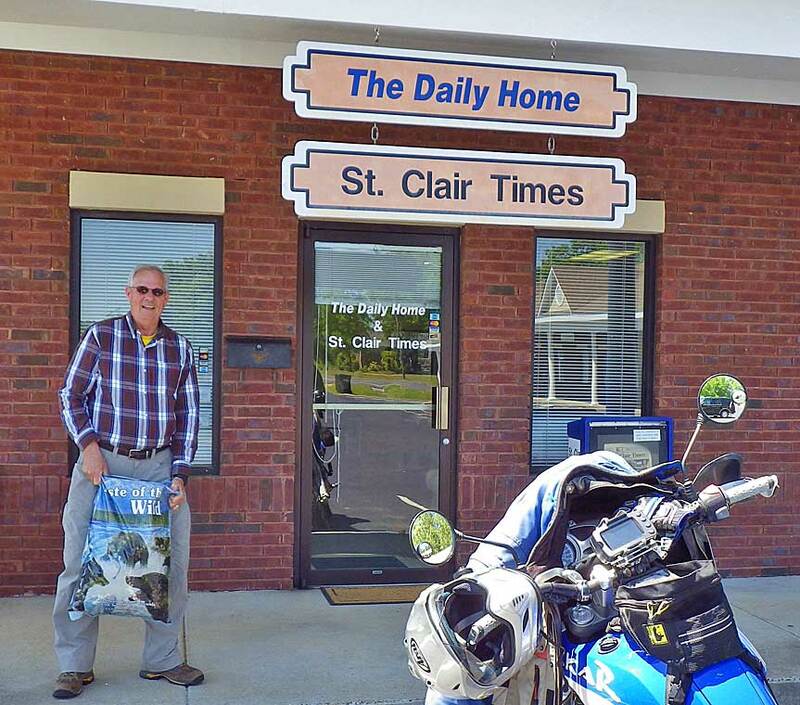 In the photo below David is holding up the 30-pound bag of dog food I brought to his office on my motorcycle Thursday. Roscoe and Bailey go through a bag this size in about two weeks! Saturday, after more than three months of work, my brother bonded together the two halves of his prototype carbon fiber classical guitar. He plans to market and produce these for players who camp, canoe or otherwise want to have a guitar in situations that would damage or destroy a conventional wooden guitar. I will bring this prototype guitar along on the trip for some real world testing. It should be the perfect instrument for a trip like this because the body, top, neck, fretboard and headstock are made of lightweight, high-strength carbon fiber. It is about half the weight of a comparably-sized wooden guitar, very strong and impervious to water. In fact, I won’t even need a case for it! I do plan to tether it to the canoe, however, to prevent it flying away in a wind gust! The photo above was made just after the guitar came out of the mold and the excess top overhang trimmed off. The tuners are yet to be mounted and several hours of cleanup, sanding and finishing work remain to be done, plus setting up the playing action, but it’s over 95% complete as of today. To view more photos of the guitar construction from Saturday, click on the headline for this update to open a gallery of images. 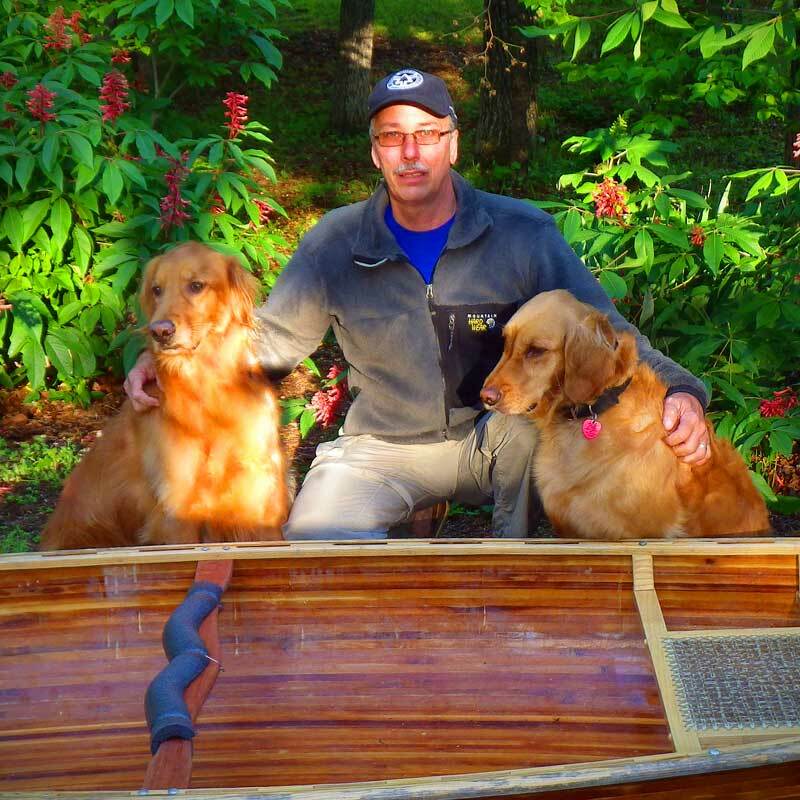 I took this photo this morning of the Crew: L-R are Roscoe, Me, Bailey and our 15-foot cedar strip canoe, for a story going into the May edition of Alabama Living Magazine inviting folks to follow us along the Alabama Scenic River Trail on this website. The foam tube was already split along one side, so it was just a matter of sliding it over the yoke and using three pieces of picture-hanging wire to hold it in place. A brief walk around the yard showed that it’s a huge improvement and will add only a few ounces of weight. Today I rode down to Lay and Mitchell dams on the Coosa River today to scout the portages around the dams. These were the last two for me to scout of the six that I’ll be portaging around. The Lay Dam portage (photo below) is the easiest of them all – about a quarter-mile, mostly downhill carry with a relatively easy, well-marked trail. The Mitchell Dam portage will be the most difficult of all, according to what I can read and could see from the opposite bank. There was no way to get to the portage – which is on the Coosa County side of the river – because the only road/trail to it was gated and posted. There is a shuttle service around the dam available that I may end up using. Will have a look when I get there and decide then. Yesterday I rode to my planned launch point for our upcoming Alabama Scenic River Trail trip at Canyon Mouth Park at the end of Little River Canyon and decided that by May that section of river will be too low to run in a cedar strip/fiberglass canoe loaded with two dogs, food and camping gear. Checking the river at several points it was barely run-able with yesterday’s medium high springtime water level. By may much of it would require dragging over. 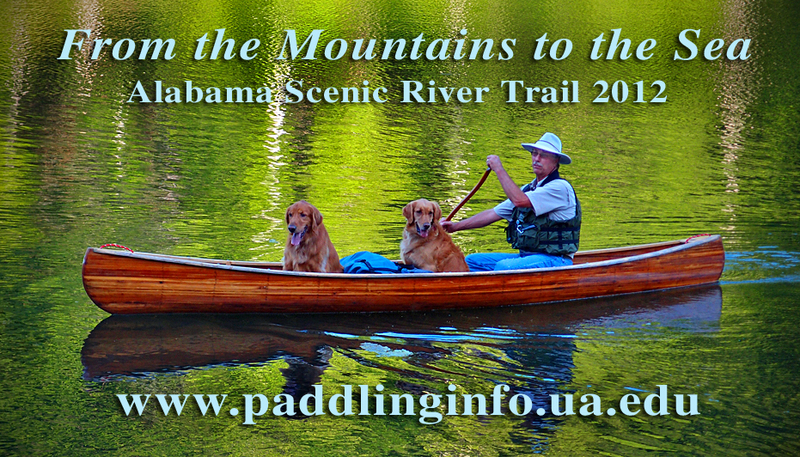 So I’ll be putting in at the point where the Coosa enters Alabama from Georgia, still on May 5. Today I got both dogs into the canoe at the same time; they did pretty well. We still will be doing more practice sessions before the May 5 Launch Date, however. Another problem that needed attention was the lack of a carrying yoke. 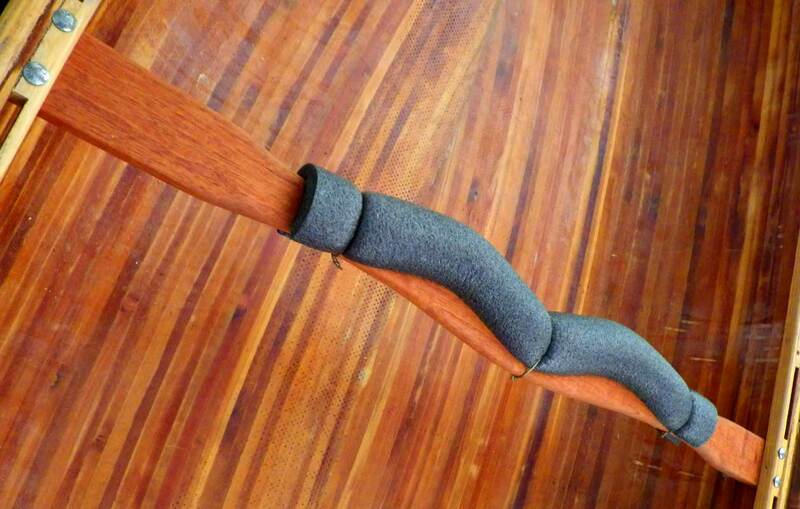 The yoke replaces the center thwart in the canoe and has a curved center section to better fit the back of the neck. This makes carrying the canoe upside down, balanced in the center, quite comfortable. Because this trip will involve carrying the canoe and all the gear around multiple dams, this is an important consideration. This canoe had a single crude center thwart that for some reason the builder placed more than 10 inches off center, which made carrying the boat by myself nearly impossible because it was off-balance. The only yoke I was able to find was also ash, but it was three inches too short for my extra-wide canoe, so my brother and I used it as a pattern to make one from a piece of Spanish cedar lumber he had on hand. 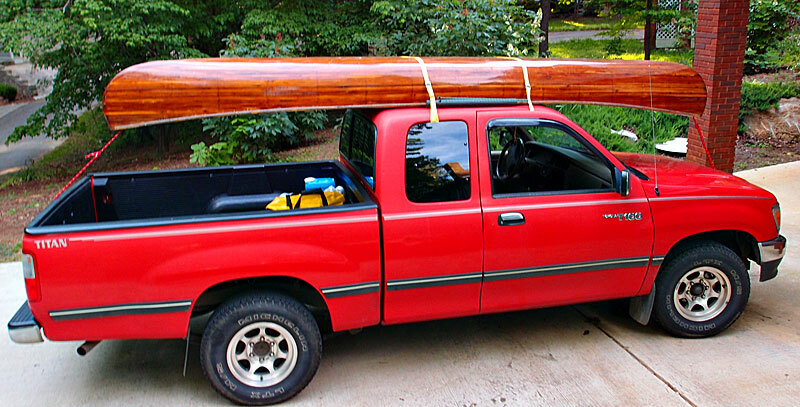 The new yoke matches the color of the cedar in the canoe better than the ash would have, and it’s lighter by almost a pound! One of the first orders of business for this project was to find a waterproof camera capable of capturing quality still and video images. My plan is to take only one camera that can do it all. It had to be a waterproof camera that was always accessible because I’ve learned over the years that often the best images won’t wait for me to extract a camera from the safety of a watertight case. Also, with my two canine buddies along, I expect to have some unexpected capsizes! When the camera arrives later this week I’ll be posting some test stills and video and sharing my initial impressions for those of you who may be interested in how the camera works. Last week at Brushy Lake I videoed Roscoe’s first time in a canoe. He still needs some practice! Yup… both of the pups are taking to the boat well!